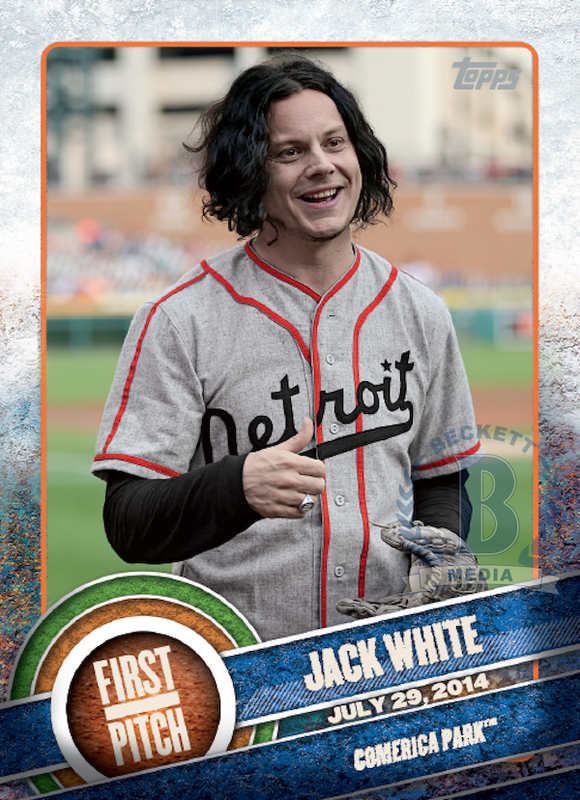 A Jack White baseball card will be released next month. Topps is introducing a new series of insert cards titled First Pitch, which memorialize celebrities who have thrown out the first pitch at baseball games over the years. The photo of White was captured at last year's Detroit Tigers' game (July 29th, 2014), and features him decked out in a vintage Detroit jersey. Fifteen different cards are included in the First Pitch series -- other musicians appearing in the series include Eddie Vedder (Chicago Cubs), Tom Morello (Chicago Cubs), Macklemore (Seattle Mariners), and 50 Cent (New York Mets). The First Pitch insert cards are rarer than the regular cards and will be randomly included in the Topps Series 1, which arrive on February 6th. For more details visit Beckett (via CBS Sports) and Topps.